This was my first project as a designer that I handled from conception through print production. This was a semester long project that I took during my time studying abroad in Perth, Australia. 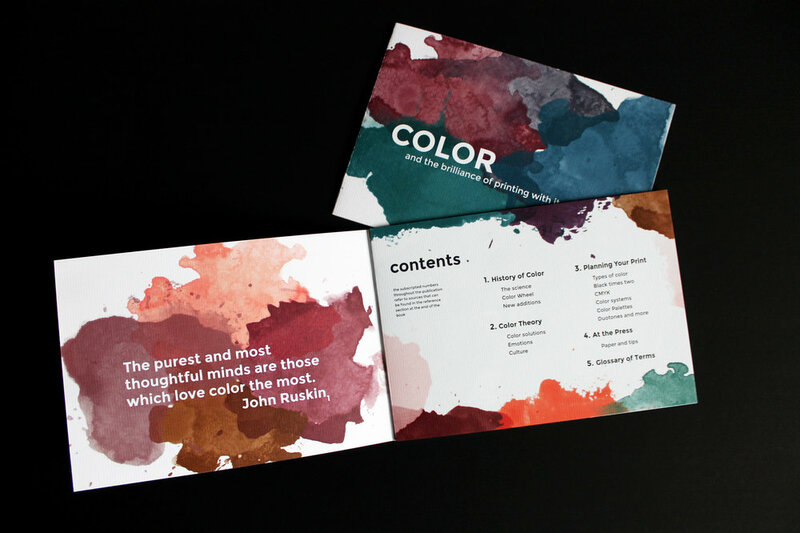 This was introduction to color systems, setting up files for print, paper selection, printing press options, copywriting, and pretty much absolutely everything graphic design related. The project began with designing a style guide, and adjusting based on feedback/critiques. After deciding on a topic that was related to print production, the process of researching and writing the 24 page booklet began. I had never learned about the theory or meaning behind color before, and being that it is so influential in mood and aesthetic I thought it would be an important thing to learn. I then located a local printing press and sought out paper samples to make an educated decision on what paper I wanted to use. I chose the paper to replicate the paper used in watercolors. Finally, I chose the binding style that I wanted and saw it through to the end. Looking back from where I am now, it’s exciting to see my growth and see aspects that I would change about my work from when I was just starting out. That being said, I’m still incredibly proud of this project and all of the effort and love that went into it. If you’re interested in seeing the print ready project, find it here!